A year ago, when Jenn and I were out here in Clarksville praying about moving here, we went to the Riverwalk. One of the first things I said was, “I can imagine having an Easter sunrise service right here.” I’ve never been able to get that idea out of my head, so, on Wednesday night, we made it official. As we celebrate the Son rising, the sun will be rising. 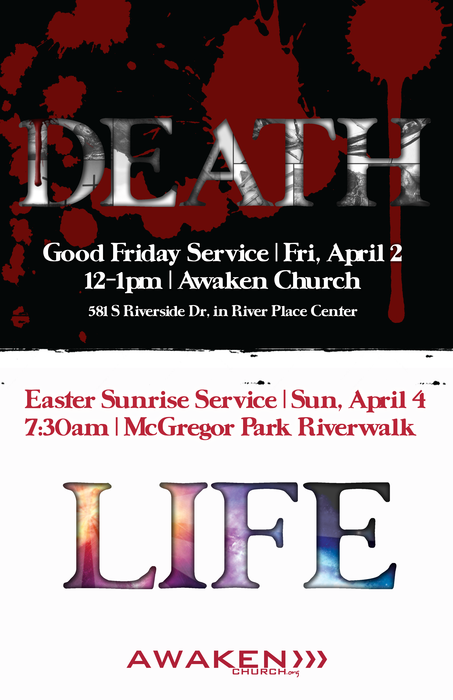 That’s right – Awaken’s first Sunday morning service will be Easter Sunday, April 4 at 7:30am. We’re not switching over to Sundays for good – we’re just meeting on Sunday instead of Saturday that one weekend. The service will be held at the McGregor Park Riverwalk in the outdoor amphitheater right on the river! Of course there will be coffee and donuts to go along with the crisp morning air. You should also make sure to bring some blankets to sit on and stay warm with, just in case. We’re going to celebrate Jesus’ resurrection as close as we can to the actual time it took place – early in the morning on the first day of the week. Whether you’ve ever been to an Easter sunrise service or not, you need to plan on being at this one! We will celebrate the main thing that separates Christianity from every other belief: OUR GOD IS STILL ALIVE! It will be an exciting time of worship with Jenn, a Gospel message about the resurrection, and fellowship, as well as a strategic time to get some friends to go to church with you. As you know, Easter is one of 2 days (Christmas is the other) each year that people who don’t normally go to church, go to church. So, begin praying now about who you’re going to invite, and SPREAD THE WORD! If you want a poster or two, make sure to ask for them at church. We hope to WAKE UP the city of Clarksville and show them that we have a reason to party!